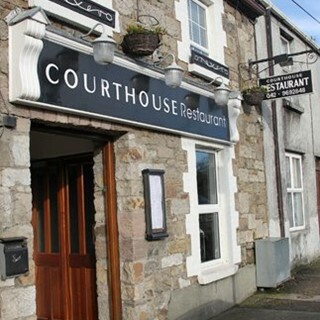 Open since October 2009, Courthouse Restaurant is set in an old town house situated beside the picturesque courthouse in Carrickmacross. Traditionally furnished to complement the building with exposed wooden ceilings, open stone walls and dark wooden tables throughout. 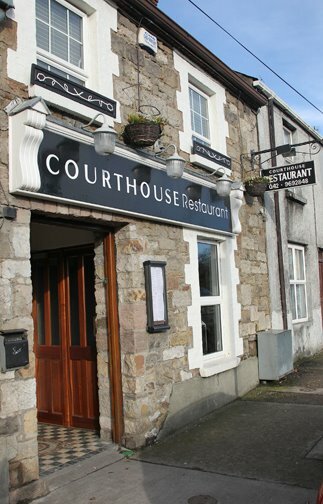 Courthouse Restaurant incorporates a ground reception and drinks area with dinning located upstairs overlooking the busy main street of Carrickmacross. Our mission is to provide the best, freshest cooked seasonal food with European and a little Asian flavours, served with professional, yet relaxed, friendly service. At Courthouse Restaurant our aim is to exceed customer and our own expectations and try to continually evolve and improve on what we have achieved to date. I took my mother as a belated Mother's Day treat and we were both hugely impressed by the fabulous food and excellent service. The portion sizes were perfect and a good range of options to choose from. We will definitely be coming again to try out more. the steak should at least have a compliment of veg. the meat parcels starter were very good, chicken main course ok and cod ok.
We have eaten at the restaurant 5 times over last 6/7 years. I just think it could do with a huge change, on all fronts. Maybe a fine dining menu would not work in this area. this is part of the difficulty. I have no doubt the chef could do it. Lovely food,great service,will definitely be back.thanks. Excellent Staff/ Food/ Service as always. Excellent food and it comes at very competitive prices. The restaurant although small feels quite roomy as the tables are set well apart. There is also a nice waiting area downstairs which makes waiting for your table a comfortable experience. Absolutely fantastic meal- food, wine, choice on menu, service and value for money. The restaurant was so cosy- a lovely setting for dinner with friends. The courthouse never disappoints- we'll be back again soon! Really beautiful food and in a cosy setting. A great atmosphere. We will definitely be back. Thank you. We had a wonderful evening and enjoyed everything thoroughly. The food was fantastic and the service was great. Not over the top....just right! Was as good as always. Well rounded dish and loved the new wine suggestion it was nice that our server new what I liked and remembered my taste in wine. The food was unbelievable and the service was the same! Food came out so quickly and in perfect portions. The service was fantastic, we were very well looked after. Would 100% recommend this restaurant! This was a special gathering for our friends and the food, service and staff were just wonderful. Couldn't have had a better evening! Thanks to the chef and staff at the Courthouse!! The ricotta and spinach dumplings were delicious and satisfying. The chocolate mousse with the vanilla custard was such a great combination along with the hazelnuts and the dusting of chocolate. The food is always so well presented. The staff are genuinely friendly yet not overly fussy. Thanks to all for a lovely lunch. Cheers. Wonderful food. Staff so accommodating and friendly. Cannot recommend highly enough ..
Food was fabulous but find it a little over priced. Great food. Menu somewhat limited though.